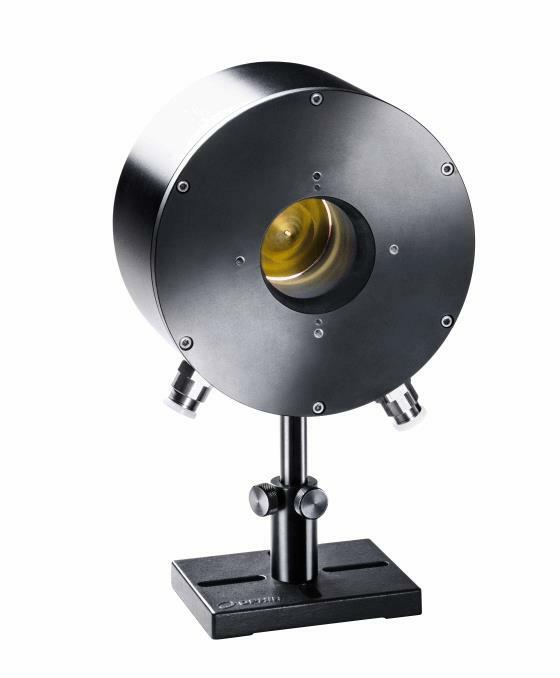 Ophir Photonics’ new 15K-W-BB-45 is a high damage threshold sensor designed to measure continuous laser power from 100 W to 15,000 W over the spectral range from 0.8 to 2 µm and 10.6 µm. This compact, water-cooled, thermal laser power measurement sensor features a deflecting cone and annular absorber that tolerates high power densities up to 10 kW/cm2. The 15K-W-BB-45 is NIST-calibrated, highly linear, and provides precision readings of power stability over time with no drift. The sensor includes a standard 5-meter cable for connecting to a laser meter or PC interface. The meter’s “Smart Connector” interface automatically configures and calibrates the display when plugged into one of the company’s measurement sensors. For more information on the 15K-W-BB-45 thermal sensor, download the datasheet.